It’s a mixed nerve, i.e., composed of both the motor and sensory fibres but mostly it is motor. Vagus nerve is the 10th cranial nerve. Its area of distribution goes past the head and neck-to the thorax and abdomen. It’s the longest and most widely distributed cranial nerve. It’s so called due to its wide-ranging obscure course and distribution. It’s a vagrant or wandering nerve. It spreads the fibres of a cranial part of the accessory nerve and carries majority of the efferent fibres of the cranial part of the parasympathetic outflow. Special visceral efferent fibres: supply the muscles of palate, pharynx and larynx. They originate from nucleus ambiguus. General visceral efferent fibres: originate from the dorsal nucleus of vagus and supply parasympathetic innervation to heart, bronchial tree and majority of the GIT. Special visceral afferent fibres: carry taste sensations from the posteriormost part of the tongue and epiglottis and terminate in the nucleus tractus solitarius. General visceral afferent fibres: carry general sensations from the mucous membrane of pharynx, larynx, trachea, esophagus and thoracic and abdominal viscera and terminate in the nucleus tractus solitarius and some in the dorsal nucleus of the vagus. 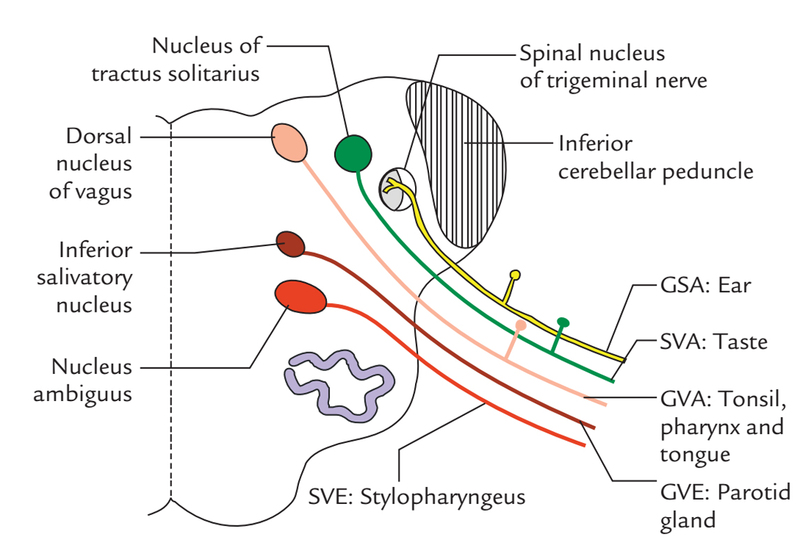 General somatic afferent fibres: carry general sensations from skin of the auricle and terminate in the nucleus of the spinal tract of the trigeminal nerve. The vagus nerve originates from the lateral aspect of the medulla between the olive and inferior cerebellar peduncle by about 10 rootlets below and in line of the rootlets of the glossopharyngeal nerve. These nerve rootlets unify to create the nerve trunk which runs laterally, crosses the jugular tubercle and leaves the cranial cavity by going through the middle part of the jugular foramen enclosed in the common dural sheath with the 11th nerve. A smaller superior ganglion is located inside the jugular foramen. The bigger inferior (nodose) ganglion is located just below the jugular foramen. Both the ganglia include the cell bodies of the sensory fibres of the vagus nerve. The superior ganglion includes the cell bodies of GSA fibres, on the other hand the inferior ganglion includes the cell bodies of visceral afferent fibres. The cranial root of the accessory (11th) nerve combines with the vagus nerve just below its inferior ganglion and thereby transfers all its fibres to the vagus nerve for distribution. After coming out of the cranial cavity via the jugular foramen, the nerve runs vertically downward inside the carotid sheath in the neck first between the internal jugular vein laterally and the internal carotid artery medially and after that between the internal jugular vein (laterally) and the common carotid artery (medially). At the root of the neck, the nerve enters the thorax. 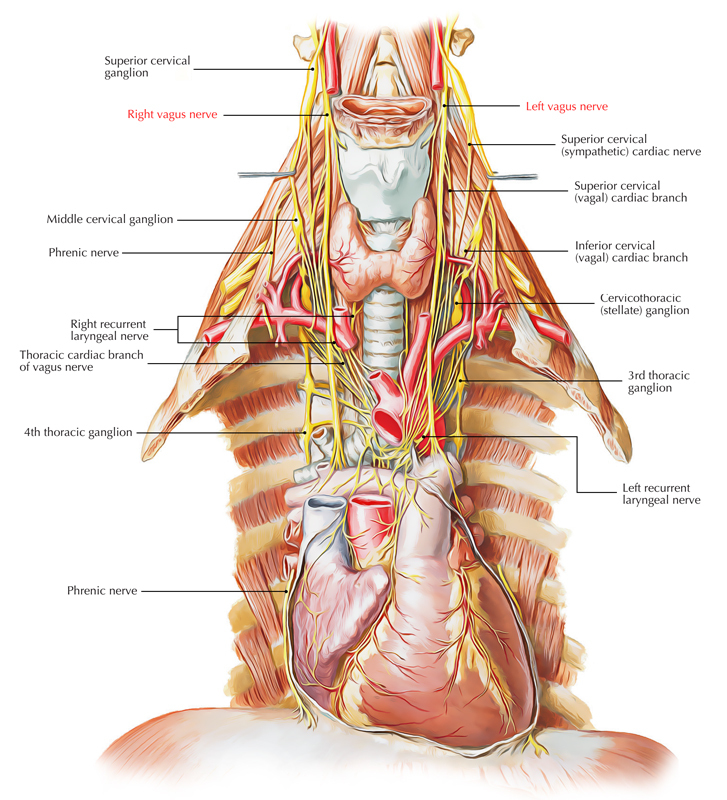 The right vagus nerve enters the thorax by crossing in front of the right subclavian artery, while the left vagus nerve enters the thorax by passing between the left common carotid and left subclavian arteries. Meningeal branch: It appears from the superior ganglion, takes a recurrent course and enters the cranial cavity via the jugular foramen to supply the dura mater of the posterior cranial fossa. Auricular branch (Arnold’s nerve or Alderman’s nerve): It originates from the superior ganglion, enters the mastoid canaliculus on the lateral wall of the jugular fossa and issues via the tympanomastoid fissure just behind the external auditory meatus to supply the skin on the rear of the meatus and adjoining part of the auricle. Subsequently it enters the meatus between its bony and cartilaginous parts to supply the floor of the meatus and the tympanic membrane. Stimulation of the nerve, as in syringing of the ear, can cause reflex coughing (ear cough), vomit-ing and even cardiac arrest. All the muscles of soft palate with the exception of the tensor palati that is supplied by the mandibular nerve (via the nerve to medial pterygoid). Branches to carotid body: It appears from the inferior ganglion. The external laryngeal nerve (motor) runs down-ward in business with superior thyroid vessels and supplies cricothyroid muscle. It also supplies twigs to the inferior constrictor and pharyngeal plexus. The internal laryngeal nerve (sensory) enters downward and forward toward the gap between the middle and inferior constrictors. It pierces the thyrohyoid membrane to goes into the larynx. It supplies the mucous membrane of larynx above the vocal cords andmucous membrane of the pharynx, epiglottis, vallecula and the posteriormost part of the tongue. Superior and inferior cervical cardiac branches: Thesuperior cardiac branch appears in the upper part of the neck and the inferior cardiac branch in the lower part of the neck. They goes into the thorax via the thoracic inlet. They take preganglionic parasympathetic fibres to the heart and are cardio-inhibitory. The inferior cervical cardiac branch of the left vagus nerve joins the superficial cardiac plexus. The staying cervical cardiac branches of both the vagus nerves join the deep cardiac plexus. On the right side, it originates in the root of the neck from the vagus nerve as it crosses in front of the subclavian artery, winds around the very first part of the subclavian artery and after that ascends upwards (in a recurrent direction) in the tracheoesophageal groove. On the left side, it appears in the superior mediastinum from the vagus nerve as it crosses the arch of the aorta (lateral aspect). It hooks below the arch of the aorta on the left side of ligamentum arteriosum behind the arch of aorta on its way to the tracheoesophageal groove. 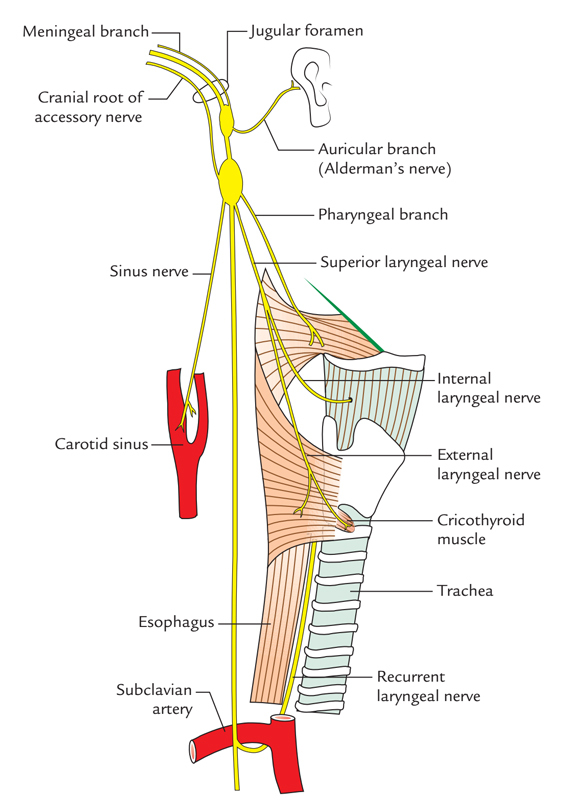 The recurrent laryngeal nerve gives motor innervation to all the intrinsic muscles of the larynx (with the exception of the cricothyroid that is supplied by the external laryngeal nerve) and sensory innervation to the mucous membrane of laryngeal cavity up to the vocal cord. Every recurrent laryngeal nerve enters deep to the inferior constrictor muscle to go into the laryngeal cavity deep to the cricothyroid joint. Now it’s named the inferior laryngeal nerve. The tickling of the cutaneous distribution of the vagus nerve arouses jaded desire. The Alderman in early Roman days utilized to stimulate their desire by dropping chilly water supporting the ear supplied by the auricular branch of the vagus nerve Because of this, the auricular branch of the vagus nerve is also named Alderman’s nerve. Seemingly, this happens by a reflex increase in gastric motility supplied by the vagus nerve (to the stomach). The vagus nerve can be analyzed medically by requesting the patient to open his mouth and say ‘ah’ and after that comparing the palatal arches of the 2 sides. If the vagus is undamaged, the soft palate rises (is elevated) in the midline. In bilateral lesions, the soft palate falls. In the unilateral lesion, there’s flattening (drooping) of palate arch on the side of paralysis and uvula pulled to the normal side.